Ooh, it's been a while since my last submission, man I'm getting rusty >_>. 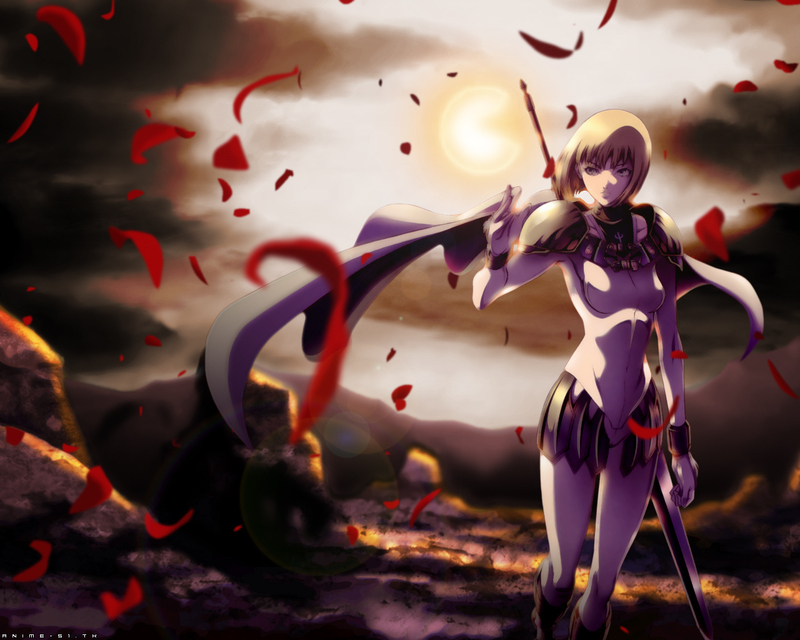 I just recently finished watching Claymore, good series, though the ending was... meh. But I had to make a wall of it of course. The DVD cover scan of Clare was found here, and the background was inspired by the ending credits. It was a pain to recreate the bg from a low-res screenie, and I threw in a lens flare even though I know that's usually frowned upon >_<. Many hours have gone into this, as have many layers. All I have to say is the pen tool is the best thing since ramen (especially since I had to do this with a mouse :P). Enjoy ^^! Have to agree with pmaster4, your walls are fantastic. Clare looks soooo cool in this , thanks for sharing! Hi, h r u my friend ? Girl with sword! girl with sword! she's great! A splendid wall if I do say so myself. A genius at wallpapers you are. Very nice wall, good color balance, depth and flow. And the flare is so restrained that I didn't even notice it at first; also, the back-lighting on Clare looks very nice. I nice WP. I like the Flower/Rose Blossoms with the blur effect (besides 1 or 2^^). The only thing I would change is the ground. The surface doesn't look authentic.